Features, Selections: 45 Drink, Columns and Selections: 5 Trays - 9 Columns per Tray, Capacity: 360 - 405 items depending on package size, Heavy Duty Welded All Steel Construction, MDB Protocol for, Coin Changer and Bill Acceptor, Glass Front Live Display, Multiple Pricing From $0.05 to $99.95, Automatic Service Diagnostics, Secure Anti-Theft Locking System, Ideal for Indoor or Outdoor Environment. 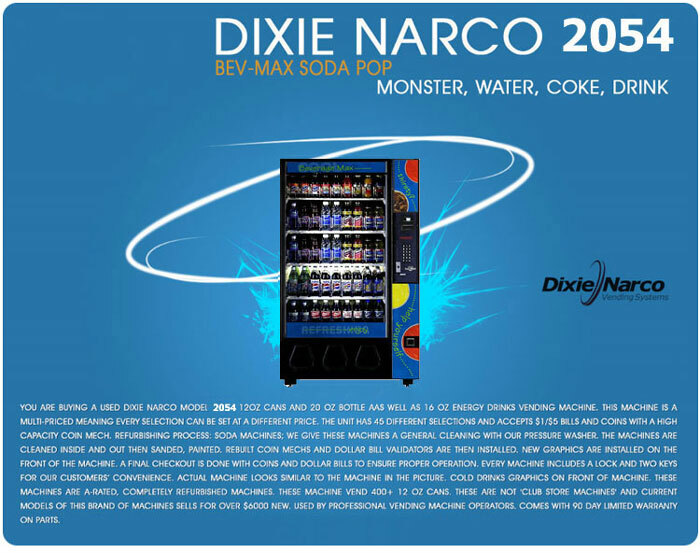 You are buying a used Dixie Narco model 5591, 12oz cans and 20 oz bottle as well as 16 oz energy drinks Vending Machine. This machine is a multi-priced meaning. The unit has 45 different selections and accepts $1/$5 bills and coins with a high capacity coin mech. Refurbishing Process: Soda machines; we give these machines a general cleaning with our pressure washer. The machines are cleaned inside and out then sanded, painted. Rebuilt coin mechs and dollar bill validators are then installed. New graphics are installed on the front of the machine. A final checkout is done with coins and dollar bills to ensure proper operation. Every machine includes a lock and two keys for our customers’ convenience. Actual machine looks similar to the machine in the picture. Cold drinks Graphics on front of machine. These machines are A-rated, completely refurbished machines. These machine vend 400+ 12 oz cans. These are not 'club store machines' and current models of this brand of machines sells for over $6000 new. Used by professional vending machine operators. Dixie Narco currently makes over 40 different shims for the Bevmax model 2145 and 5591 style vendors. We carry the most COMMON sizes of these shims and will never carry all 40 plus shims that are made for these machines. Over time we will add to the amount of types of shims that we carry based on customer needs and requests. The shims listed on our website that are listed as 12oz cans, 16oz bottles and 20oz bottles are designed for STANDARD VENDING SIZE cans and bottles. Please be aware that there are hundreds of these cans and bottles made and sold all over the USA that are not these standard sizes and have larger or smaller diameters. Due to this fact if you are not sure of the size shim that you need we recommend that you buy one or two of the size of shims that you think you need as samples to verify that they work with your product before buying them in quantity. If you need special shims in quantity for a custom product and you have the Dixie Narco part number please contact us and we will quote you for price and availability. The Dixie Narco model 5591 is one of the most versatile machines made. Due to the large amount of different shims available this machine can vend almost any size packaged drink with proper shimming. All machines purchased are shipped with a MIX of common shims, should you need more or custom shims then you would have to buy them from our parts page.